Install awnings over your windows to save money on high air conditioning bills, and make rooms more comfortable. Awnings decrease cooling loads, which are among the biggest expenses for buildings. In summer, awnings can intercept the near vertical solar rays, while letting in the low-angle rays during winter. Contact Falls Glass Service for your awning needs. Better than traditional canvas awnings – today’s canvas awnings are not “canvas” at all, but beautifully bright, strong 100% solution dyed acrylic fabric awnings. Choose from a beautiful selection of over 100 solution dyed acrylic fabrics. 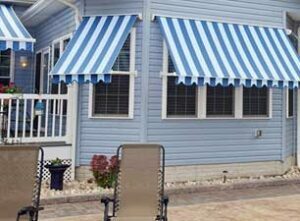 Acrylic dyed fabric awnings will not mildew or rot. Teflon coated fabrics help repel dirt and water without diminishing air permeability. The fabric is guaranteed against loss of serviceability resulting from rot, mildew, and variations of dimensional stability and color for five years. Canvas awnings can’t offer this guarantee! Dimensional stability is guaranteed to remain at +/- one percent or less in applications under proper installation and use. Color fastness is guaranteed to remain within the standards set by the Fadeometer® Test of a grade 7 on a scale of 0 to 8 under normal conditions of exposure and atmospheric pollution. Aluminum awnings have a fixed casement and extended side panels. With this permanent installation, you do not need to worry about costly put-up or take-down expenses. 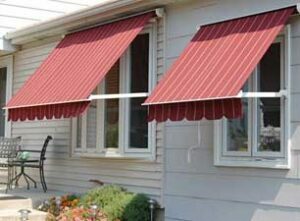 Awnings extend beyond window width so side valances aren’t required. Because air flows under the awning, heat build-up is not a problem. Windows are shielded from direct sunlight which keeps your home or business cooler in the summer. They also fend off rain and weather from your windows which adds extra life to window frames and help your house stay snug. Aluminum awnings will never rot, rust or chip or peel. The white underside allows diffused light to enter your home. Choose from thirteen popular colors for your aluminum awnings that either contrast excitingly or blend subtly with your homes decor. Most are available with contrasting color stripes. Colors are baked on at the factory. 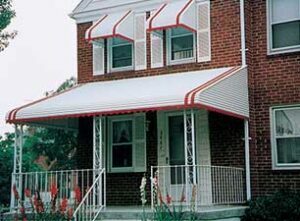 Visit our manufacturer for more awning ideas at Aristocrat Awnings.